Because the mouth is a region where changes can be easily seen, oral cancer can be detected in its early stages. Performing a self-examination regularly will help in the early recognition and detection of oral cancer, and increase the chance for cure. Research has identified a number of factors that may contribute to the development of oral cancer.The most common are the use of tobacco and alcohol. Others include poor oral hygiene, irritation caused by ill-fitting dentures and rough surfaces on teeth, poor nutrition, some chronic infections and combinations of these factors. Studies have shown that the death rate from oral cancer is about four times higher for cigarette smokers than for nonsmokers. It is also widely believed in the medical field that the heat generated by smoking pipes and cigars irritates the mouth and can lead to lip cancer. Those at an especially high risk of developing oral cancer are over 40 years of age, heavy drinkers and smokers, or users of smokeless tobacco, including snuff. Oral and maxillofacial surgeons recommend that everyone perform an oral cancer self-exam each month. If you are at high risk for oral cancer — smoker, consumer of alcohol, the user of smokeless tobacco, or snuff — you should see your general dentist or oral and maxillofacial surgeon for an annual exam. 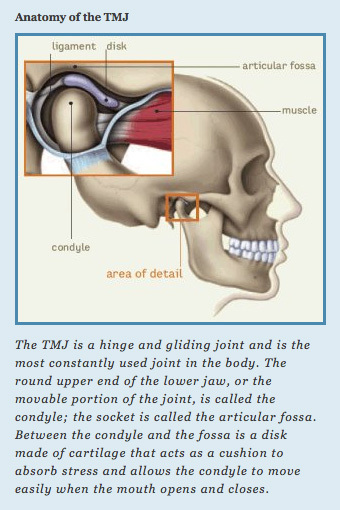 The temporomandibular joint (TMJ) is a small joint located in front of the ear where the skull and lower jaw meet. It permits the lower jaw (mandible) to move and function. TMJ disorders are not uncommon and have a variety of symptoms. Patients may complain of earaches, headaches and limited ability to open their mouth. They may also complain of clicking or grating sounds in the joint and feel pain when opening and closing their mouth. What must be determined, of course, is the cause. Determining the cause of a TMJ problem is important, because it is the cause that guides the treatment. Arthritis is one cause of TMJ symptoms. It can result from an injury or from grinding the teeth at night. Another common cause involves displacement or dislocation of the disk that is located between the jawbone and the socket. A displaced disk may produce clicking or popping sounds, limit jaw movement and cause pain when opening and closing the mouth. The disk can also develop a hole or perforation, which can produce a grating sound with joint movement. There are also conditions such as trauma or rheumatoid arthritis that can cause the parts of the TMJ to fuse, preventing jaw movement altogether. Stress may trigger pain in the jaw muscles that is very similar to that caused by TMJ problems. Affected patients frequently clench or grind their teeth at night causing painful spasms in the muscles and difficulty in moving the jaw. Patients may also experience a combination of muscle and joint problems. That is why diagnosing TMJ disorders can be complex and may require different diagnostic procedures. When symptoms of TMJ trouble appear, an oral and maxillofacial surgeon should be consulted. A specialist in the areas of the mouth, teeth and jaws, the oral and maxillofacial surgeon is in a good position to correctly diagnose the problem. Special imaging studies of the joints may be ordered and appropriate referral to other dental or medical specialists or a physical therapist may be made. Once TMJ disorders are correctly diagnosed, appropriate treatment can be provided. TMJ treatment may range from conservative dental and medical care to complex surgery. Depending on the diagnosis, treatment may include short-term non-steroidal anti-inflammatory drugs for pain and muscle relaxation, bite plate or splint therapy, and even stress management counseling. Generally, if non-surgical treatment is unsuccessful or if there is clear joint damage, surgery may be indicated. Surgery can involve either arthroscopy (the method identical to the orthopaedic procedures used to inspect and treat larger joints such as the knee) or repair of damaged tissue by a direct surgical approach. Wisdom teeth, or third molars, are the last teeth to develop and appear in your mouth. They come in between the ages of 17 and 25, a time of life that has been called the "Age of Wisdom." 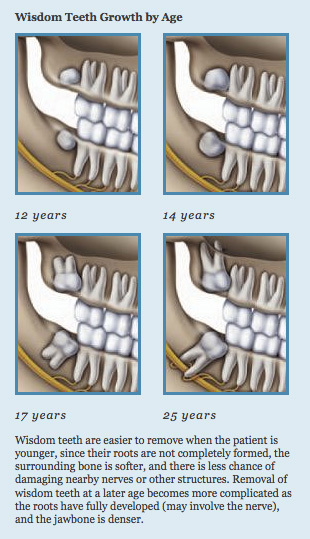 When a tooth is unable to fully enter the mouth, it is said to be "impacted." In general, impacted teeth are unable to break through the gums because there is not enough room. Nine out of ten people have at least one impacted wisdom tooth. If left in the mouth, impacted wisdom teeth may damage neighboring teeth, or become infected. Because the third molar area of the mouth is difficult to clean, it is a site that invites the bacteria that leads to gum disease. Furthermore oral bacteria may travel from your mouth through the bloodstream, where it may lead to possible systemic infections and illnesses that affect the heart, kidneys and other organs. Research has shown that once periodontal disease is established in the third molar areas, the problem is persistent and progressive, but may improve following extraction of the teeth. Must the tooth come out if it hasn't caused any problems yet? Many people believe that as long as they are not in pain, they do not have to worry about their wisdom teeth. However, pain free does not mean disease or problem free. In fact, wisdom teeth that come in normally may still be prone to disease, according to a study by the American Association of Oral and Maxillofacial Surgeons and the Oral and Maxillofacial Surgery Foundation. It is, therefore, important that your dentist monitors the health of your wisdom teeth during your annual dental check-ups. Wisdom teeth that are completely erupted and functional, painless, cavity-free, in a hygienic environment with healthy gum tissue, and are disease-free teeth they may not require extraction. They do, however, require regular, professional cleaning, annual check-ups and periodic radiographs to monitor for any changes. If your dentist or healthcare professional recommends that your wisdom teeth be removed, you will most likely be referred to an oral and maxillofacial surgeon for the procedure. Before surgery, your oral surgeon will discuss the procedure with you and tell you what to expect. This is a good time to ask questions. Also talk to your surgeon about any concerns you have. Be sure to let your doctor know about any illness you have and medications you are taking.